Diamonds are billions of years old and will likely exist far beyond the lives of their current owners, but how long have they been known to humans? How did they come to hold a place as the most coveted and popular gemstone and the traditional choice for an engagement ring? What’s more, how did the practice of diamond cutting start and from where did different cuts evolve? The word diamond is derived from the Greek word “adamas,” meaning unbreakable or unalterable, and we can trace a human awareness of diamonds back to antiquity. Diamonds were originally discovered in India and sources vary on whether this was between 2500 and 1700 BC during the Bronze Age or a bit later and closer to 1000 BC. 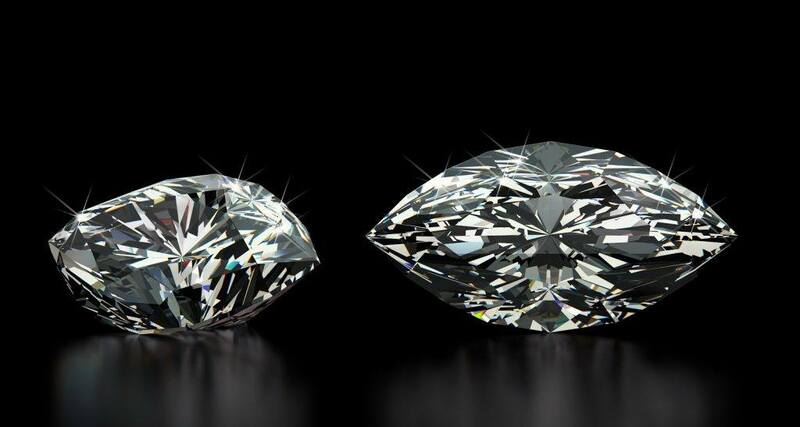 Diamonds made their first recorded appearance in the Sanskrit texts the Arthashastra and Ratnapariksha. Romans began the tradition of wearing engagement rings with betrothal or ‘truth’ rings that reflected a commitment between individuals (not always strictly marriage). The ring was worn on the third finger of the left hand because Romans believed a vein in this hand connected directly to the heart. This ring became a symbol of a promise of marriage in the Middle Ages. In 1215, Pope Innocent III declared a mandatory waiting period between betrothal and the actual marriage ceremony. This decree made it necessary for couples to pledge symbols of their promise and as rings were just becoming a crucial part of the wedding ceremony, it made sense to use them as such. Archduke Maximillian of Austria commissioned the first diamond engagement ring in 1477 for Mary of Burgundy, with whom he was said to be deeply in love. This sparked a tradition of diamond engagement rings that continues to this day. The history of diamond cutting is murky, with no one being certain where the practice first emerged. The most definitive signs begin in Venice in the 1330s. Today, a wide variety of diamond cuts and styles exist with strict parameters governing quality and style, but in the early days, cuts were limited by the tools of their merchants. The earliest cuts were simple point and table cuts, with the point cut following the natural cut of the diamond and table cuts being the first to use faceting. The similar step cut followed the table cut, which evolved into what has been known as an emerald cut since the 1940s. Though Venice was the first cutting center, the economic center of gravity shifted north at the end of the 15th century and Paris, Antwerp, and Brussels emerged as the primary polishing centers in Europe. Here, diamond cutting mills began to focus energy and attention on new methods of cutting and polishing rough stones. During the 16th century, tools were developed that enabled the invention of the rose and transition cuts. This was when the process of faceting really took hold, allowing for an expansion of shapes. The “rose cut” resembled a rose, while other shapes also became possible. In 1562, Mary Queen of Scots famously gifted her cousin Queen Elizabeth I a heart-shaped diamond ring as a symbol of friendship (Elizabeth perhaps did not appreciate the gift, considering she later sentenced her cousin to death by beheading). In 1600, claw or prong settings were first used to secure diamonds in rings and other jewelry. These techniques endured until the 18th century when diamond production in Brazil also brought the rise of the round and cushion cut diamonds, including the old mine cut, the grandfather of our modern brilliant cut. At this time, diamond cutting was becoming more inventive, though diamonds still remained largely in the hands of the aristocracy. King Louis XV of France cheekily had his jeweler cut a diamond to reflect the shape of his mistress’ mouth, the Madame de Pompadour, a cut now known as the marquise or navette. Diamonds remained the domain of the aristocracy until the late 19th century, when the discovery of the Kimberly mine in South Africa made the sale of diamonds boom at a prodigious rate. No longer quite as rare and with the powerful marketing of De Beers behind them, diamonds were available to anyone who could afford to buy one. This, combined with the sale of the French crown jewels (as an outdated symbol of the monarchy) in the 1870s to a series of buyers including New York based Tiffany & Co., launched a diamond craze that continues to this day. In 1931, the Gemological Institute of America (GIA) was founded by Robert M. Shipley, which implemented a series of grading parameters for cut, clarity, size, and more to aid in the pricing of diamonds for the consumer market. As the twentieth century continued, we not only saw the development of stricter regulations for diamond cutting and diamond mining, but also the rise of the diamond in pop culture. From the iconic blue box of Tiffany’s to the mythic “Heart of the Ocean” at the center of Titanic, diamonds have captured our public imagination and are firmly entrenched in our history.